RealMindz looks forward to working with Ann in the coming year and helping parents CONNECT the pieces to help their children. We began our RealMindz program introducing people we love with a little boy from Lancaster, Wisconsin named Mac, who is the son of Ann and Dr. James Yurcek. Today, we share Mac’s Christmas Miracle and his mom’s think out of the box to build Live Abilities for her sweet Kindergartner. We wish each of you and your families a very Merry Christmas, Happy Holidays, and the Best New Year Ever! 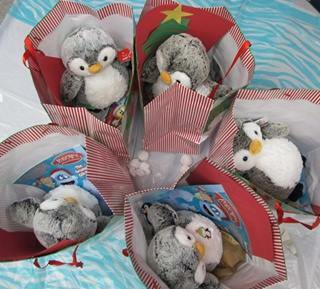 A special needs kindergartner gives gifts to his friends in school and gets a miracle in return! When McKellan Yurcek, known as Mac to his friends at school, began Kindergarten this year, his Lancaster, Wisconsin teacher, Mrs. Chambers gave him Snack Penguin to help him focus on eating. Mac is a silent little boy who is diagnosed with Fetal Alcohol Syndrome, Autism, an Involuntary Movement Disorder, immune compromise and vision challenges. He needs a high calorie intake to survive. Everyday Mac asked to take Snack Penguin home and he did not want to return him. Eventually mom, Ann Yurcek, found a duplicate penguin Mac calls Furry. Because Mac had trouble talking to other children, Mom sent Furry to school everyday with Mac in his backpack to comfort him. 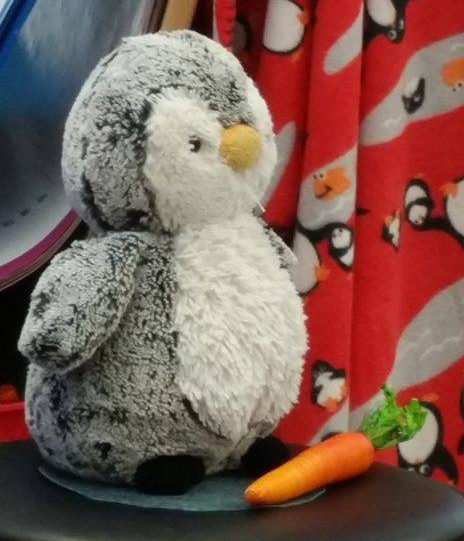 Furry and Snack Penguin became classroom cousins. Over time it was discovered, Furry did more than just comfort Mac. 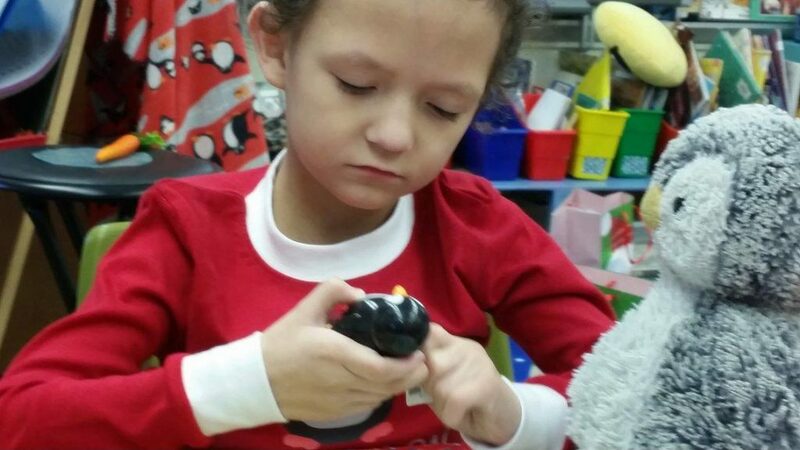 Furry became a bridge of friendship and communication in the Lancaster Kindergarten Penguin classroom. As time went on Mac realized that Furry stabilized the movement in his arms and helped him walk without falling so often. Holding Furry was comforting. Kindergartners loved being with Mac and the more they tried to talk to Mac, the more anxious Mac got trying to talk back. One day, at the computer, Furry began answering. Mac was communicating through Furry even though the professionals had struggled. All fall, Furry has been going on all kinds of adventures with the Yurceks to build relationships with his classmates. Furry has been in candy stores and on reindeer rides with Mac. He is a friend with Elf on the Shelf, he’s been a doctor and done rounds with Mac’s Dad, gone fishing, and he’s been a firefighter. Anything Mac does, penguin does. Mac and Furry are constant companions. And if Mac can’t go to school that day, Furry may show up online to say “Hi” in penguin speak. Mom hatched a plan. What if all the children could have their own penguin, just like Furry? Then the penguins could become friends and all the kids to talk through and about their penguins with Mac – maybe; just maybe Mac would soon transition to talk back to children. Mac is able to speak, but only when he is not anxious and speaking on what he knows. He has trouble with conversation. With holidays coming and parents searching for Hatchibles. Mac’s Mom was hatching a plan to increase integration into his classroom. Mac stood out as different. “What could be done to create equality when Mac was so challenged?” In search of another Furry, Google images helped Mom find out who Furry was. He is made buy Aurora and he comes in four sizes and different colors. But where could she get one for each kindergartner in his classroom? It took seven stores, Amazon, and Barnes & Nobel to solve the dilemma and special permission to break classroom rules to buy presents for the other children—all without his teacher Mrs. Chambers knowing the special Christmas secret. On Thursday, Mac finally got to return to school. He was on antibiotics and had already lived through all the school bugs. Mac’s autism therapist joined him with his mom delivering fourteen bags, a big wrapped package for Mrs. Chambers and a teeny tiny package for Snack Penguin. Mac went around the room, child by child and with prompting wished each and every one of his friends “Merry Christmas”. This entry was posted in ADOPTION, ANN YURCEK, CONNECT, CURIOSITY - CHILDLIKE, Jodee Kulp, LIVE ABILITIES and tagged teaching children with fas. This was such a wonderfully thoughtful gift- for Mac, his classmates, and Mrs. Chambers. The excitement and joy that the children expressed as they showed me their penguins was absolutely beautiful to see. I love that what began as a tool to help Mac adjust to his new surroundings & eating “just a little bit more” (oh, that sneaky Snack Penguin, always trying to snitch a goodie from Mr. Mac!) has turned into SO much more. The resulting friendship and learning that is taking place in that classroom and throughout our school is incredible. Thank you for sharing the story of a very special boy, a very special penguin and the very special results of their friendship. We are blessed to be a part of Mackie’s World. Leah – Thank you for your kind words. Ann and the Yurcek family are remarkable people and incredible advocates for all of their children. Ann is exceptional at CONNECTING the DOTS to create understanding and new connections. We love having her join us in this new RealMindz adventure. Now that I have regained composure after quite a big surprise and delight, it is my turn to have Snack Penguin visit Mac along with me. With such extreme weather, Snack and I will visit with Mac online as well as personal visits with books, projects, and conversation to keep the kindergarten experience ongoing. This is so delightful… Mac and Furry love visits and they are the team that CAN DO IT!